Many times we can take our pets for granted. Sure, they’re part of the family and there’s no denying we love to spoil our pets. But, when things change in a household, pets are affected too. We hadn’t really thought much about this until Ben left. We did talk about the fact that we needed to get Samson a bed of his own for our bedroom. Well, for years Samson has always slept with Ben at night. But now with Ben gone, Samson will either sleep with Ryan, or he curls up in his new bed in our bedroom. Other times his bed of choice is the love-seat we have in the bedroom. I’m up for work weekday mornings around 3:10am. Like clockwork, as soon as Samson hears me up, he jumps into bed with Sandra and burrows underneath the covers. It’s amazing but Samson does indeed know something is different. He seems somewhat out of sorts and we’re sure it’s because he knows Ben is not around. I wonder what will happen later this month when Ryan ships out for FT. Jackson for his Basic Training? We’re sure Samson will adjust, but for now, lets just say he is trying to figure out what’s going on. 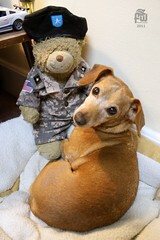 So, for today’s picture, General Sarge decided it was time to hang out with Samson for a while. This picture is actually taken in my home office. Samson has a little bed right beside my desk and whenever I’m in here, he’s snoozing in his bed beside me. Today General Sarge joined him too. This entry was posted in 2011 General Sarge Posts and tagged Army, Army Strong, Build-A-Bear, General Sarge, Teddy Bear. Bookmark the permalink.